← My Christmas Card-inal To You! who is the fairest bird of all? 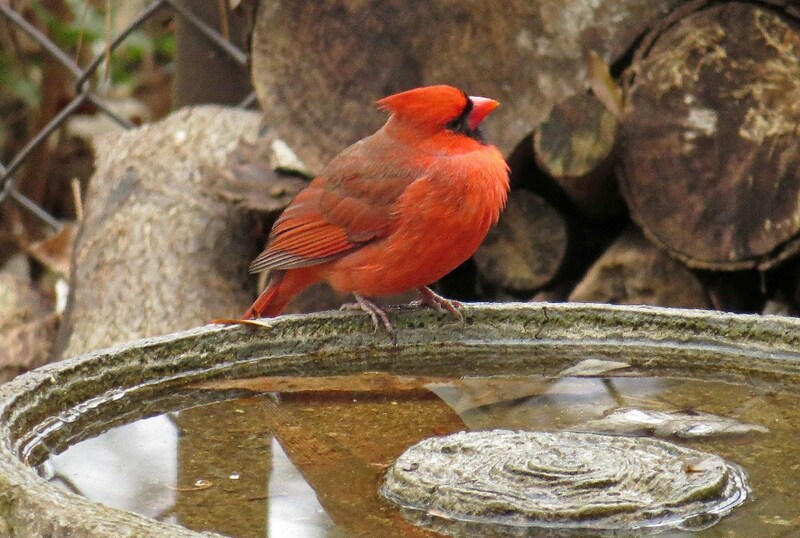 Well – I’m pretty sure this cardinal would be quick to claim that honor for himself! Although these birds are notorious for fighting with their own reflections (they have pecked the heck out of many a car mirror!) this fellow seemed more flirtatious than fierce. Or perhaps he was merely puffed up with pride over his own appearance. Whatever the reason, I love how he poofed out his feathers when he noticed his reflection! And I guess we can’t argue with his self-proclaimed title. He really is a handsome bird! 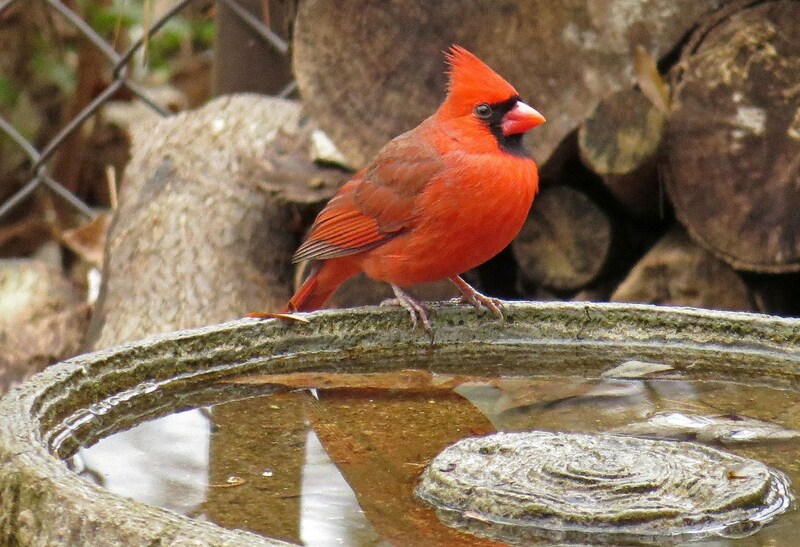 This entry was posted in Backyard Birds and tagged backyard birds, bird watching, birds, cardinals, nature, photography, wildlife, writing. Bookmark the permalink. Thanks HJ…and Happy New Year. 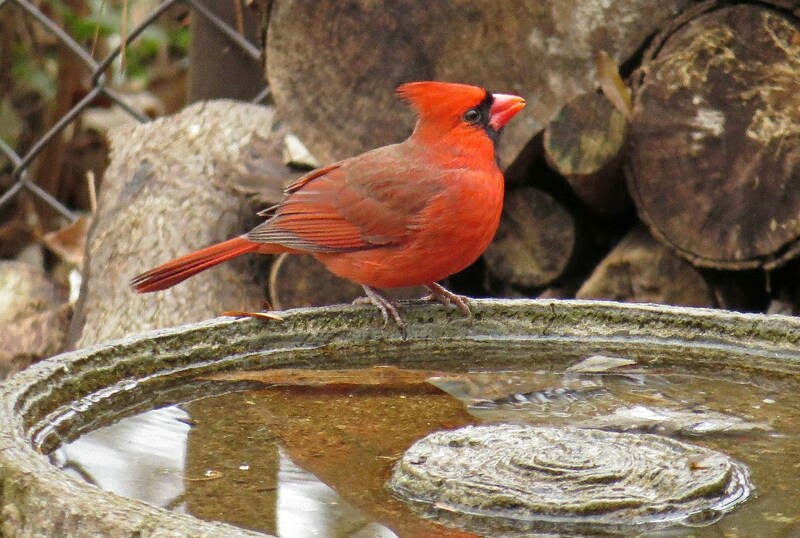 Gorgeous colors Kathy, your bird bath is certainly a great capture point for the birds. We are trying at present to find the right one for our garden. I have put birdbaths/water dishes in several places in the yard (odds are good I’ve gone a bit overboard!) and it really does seem to bring the birds. Hope you find one that you like! He was actually a bit comical to watch. He probably would have stayed longer but a male Towhee chased him off. The fairest bird of them all indeed! What a handsome follow! Happy New Year, Kathy 🙂 Your post was a great way to start off my day/year. Thanks Takami. 🙂 And a Happy New Year to you too! A gorgeous fellow, for sure. Awesome photos, Kathy! Happy New Year! May God bless you abundantly (with bird visitors 🙂 ) in 2015!